Alfred Elmore RA was a Victorian history and genre painter. He was born at Clonakilty, County Cork on the day of Waterloo,18 June 1815, the son of Dr John Richard Elmore, an army surgeon, who retired from the British Army to Clonakilty. When Elmore was twelve his family moved to London, which afforded him the opportunity to begin drawing from the sculptures in the British Museum. He entered the Royal Academy in 1832, exhibiting for the first time in 1834 with Subject from an Old Play. He was also an excellent watercolourist and his troubadour style was often compared to English Romantic landscape painter, Richard Parkes Bonington (1802-1828) and Victor Eugène Delacroix (1798-1863), the leader of the French Romantic school. From 1833-1839 Elmore lived mainly in Paris. In 1840 he studied in Munich and then settled in Rome until 1842. Between 1840 and 1844 he also travelled across Europe, visiting Venice, Bologna and Florence. Elmore returned to London and was elected ARA in 1845 and RA in 1857. Elmore seems to have been associated with ‘The Clique’, a group of young artists who saw themselves as followers of Hogarth and David Wilkie. By the late 1860s Elmore was moving away from such Hogarthian subjects towards a more classical style, influenced by Edward Poynter and Lawrence Alma-Tadema. He exhibited at the RA between 1834 and 1880 and also at the British Institution; almost all of his subjects were from English, French or Italian history and Shakespeare. Only occasionally did he attempt scenes from modern life. Robert, in this painting, is Robert of Anjou (1278-1343), known as Robert the Wise. He was King of Naples, titular King of Jerusalem and Count of Provence and Forcalquier from 1309 to 1343; the central figure of Italian politics of his time. He was the third, but eldest, surviving son of King Charles II of Naples, (the Lame), and Maria of Hungary. During his father's lifetime he was styled Duke of Calabria (1296-1309). Once King, Robert was nicknamed "The Peacemaker of Italy" due to the significant changes he made to Naples, which went from a dirty seaport to a city of elegance and medieval splendour during his reign. The arts and the university also flourished with students coming from all over Italy to study. Giotto painted several works for him. He was remembered by Petrarch and Boccaccio as a cultured man and a generous patron of the arts. His last descendant through a legitimate line was Queen Joanna II of Naples. ​The painting shows Robert, King of Naples in 1343 with a crowd of figures around his bed. He sits upright to embrace a girl kneeling before him, possibly his 16 year old granddaughter, Joanna I of Naples, who was his successor. A nurse is seen plumping his pillow behind, and his crown is visible at the foot of the bed, beside a man holding a small open box, possibly his solicitor about to document his last will and testament. A ‘loyal courtier’ is seen sitting to his right, and a young woman holding a small child to his left. 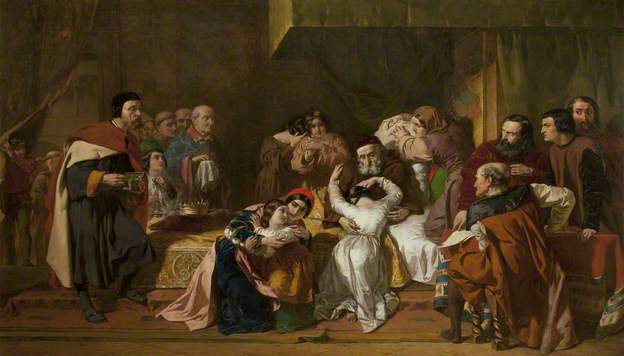 Many of the figures appear to be ‘the Good and the Wise’, as depicted in the title of the painting, with genuine concern over the King’s health and a stable transition to his successor. However, the two people standing next to the ‘loyal courtier’ look menacingly at the solicitor opposite.